What do you do when you’re a 14-year-old boy, love-struck but cash strapped, and want to give your girlfriend an evening the two of you will always remember? 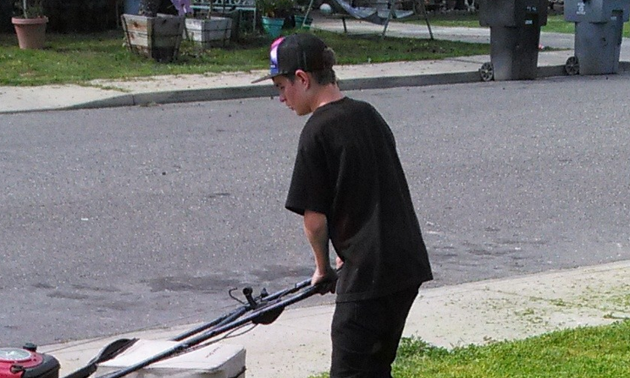 If you’re Cody Mitschelin, it’s simple: you cut grass. Young Cody, who hails from Oakdale California, had been seeing local girl Audrey Fierro for the past six months but due to Cody’s shortage of cash, the couple had only been on a few short strolls through the local park. They had never enjoyed a proper lunch date together; something Cody was determined to change. 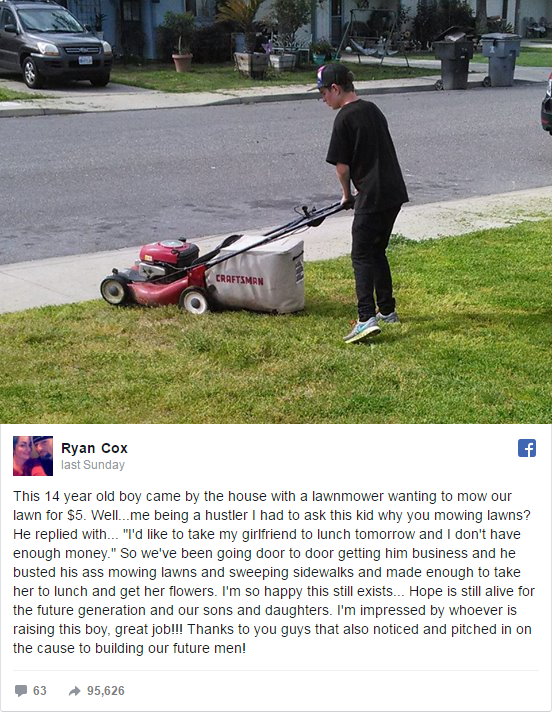 He took to knocking on doors in his local neighbourhood, offering to mow his neighbours’ lawns for the competitive price of $5 dollars (5 euro 70 cents). Sadly Cody found few takers and was becoming increasingly dejected until he came to the door of local resident Ryan Cox. After initially refusing Cody’s gardening services, Cox had a sudden change of heart as he watched the young man’s head drop in disappointment. Cody’s plight made such an impression on Cox and his neighbour Timmy Jaramillo that both men decided to post the tale on an Oakdale Community Facebook page, and included a photograph of the youngster at work. It wasn’t long before Cody’s touching tale became a social media sensation, with more than 83,000 shares since last Wednesday. After a long day’s exertion, Cody earned a respectable $45 dollars (39 euros) and true to his word, he treated his girlfriend to lunch date at a nearby pizzeria, but there were a few more surprises in store. Thanks to the internet, Cody’s story had already reached the Safari Pizza restaurant, where the lovebirds had planned to dine, by the time they arrived and the manager pulled out all the stops to ensure this date would never be forgotten. Despite daylight hours, Cody and Audrey sat at a candlelit table, where they enjoyed an afternoon of fine dining and the restaurant manager was so taken by the local lad’s story that he didn’t have to pay a penny. Soon the local press was on the scene and the young couple were caught in the media spotlight. Pictures and video footage of the first date went up online and well-wishers in places as diverse as Switzerland and Vietnam flooded message boards with words of love and kindness. Of course any social media feel-good story is never complete without a few dissenting voices from some corners of cyber sphere. One user pointed out it was “downright sexist” of Cody to insist on paying the bill, while another questioned why Audrey wasn’t paying her half. Was this how the relationship was going to progress –with the “man” paying for everything? We can only hope this didn’t spoil the couple’s enjoyment too much.